You slip through the wrought-iron gate, and the rose garden begins its seduction. Alone in the perfumed air, the visitor leaves San Jose behind, the garden’s fountain buffing the city’s din down to a faraway hum. Even today, as the city’s Municipal Rose Garden sits in the doghouse, placed “on probation” by the nation’s leading rose-garden accreditors for a dismal lack of maintenance, the buds and blooms put you under their spell. Things may seem bleak, but the garden could be in for a rose-colored revival. Despite the park’s probationary limbo, caused by downsized park staff and an exodus of garden-club gentry who used to fuss over the nearly 4,000 bushes, a great drama is unfolding here. A group of rose lovers has banded together to “adopt” the park, and they are working hand-in-hand with the city’s paid garden-keepers. They hope to assemble an army of volunteers in the new year to fight the weeds, prune the roses and remove spent blossoms to force the plants to re-bloom, a process flower-lovers call deadheading. Rounding up troops shouldn’t be hard, given that this garden has touched so many people in so many ways since its groundbreaking in 1931 – from parents who watched their kids grow up amid its blushing splendor, to the sentimentalists whose family weddings and Sunday picnics are pages in a love affair that has never stopped blooming. They come from all ages and backgrounds, yet all share a fondness for this flowery 5.5-acre stage. Bev Gannon, 71, San Jose native and former neighborhood resident: “My graduation from Lincoln High was in the Rose Garden in 1953. They played ‘You’ll Never Walk Alone.’ I remember the pretty roses, the green grass, the whole scene. We were looking out across the crowd and it was so wonderful, seeing your family, everyone taking pictures, and at the end we all cheered. “That night comes back to me whenever I drive by. That whole neighborhood is full of memories of growing up, and the world felt safe. The world today makes me kind of want to go back to those days, to have just another week or month in that place. Maybe half a pipe dream. Because the garden remains at least half-frozen in time. Roses can do that – harbor bits and pieces of the past in each new bloom. And so people “build strong emotional connections to roses, more than any other plant,” says Alexandra Withrow of All-America Rose Selections, the national group that has placed the garden on probation but is rooting for it to get off probation. On a recent morning, as their leaves glisten with dew, backlit by the sun, even the wilting petals can steal your breath away. And at the foot of each bed, on black-metal nameplates the size of a Hallmark thank-you note, the varietal names are bursting with hope: Double Delight, Perfect Moment, Opening Night and Livin’ Easy. Yet some of the beds are empty; many are choked with weeds. Too many bushes harbor dead flowers and straggly branches. The beauty still comes through, but with a close look it’s clear the place is haggard. 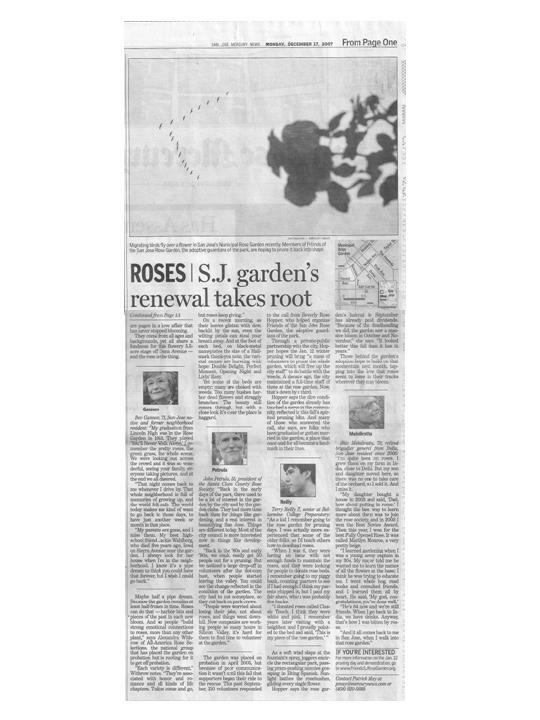 John Petrula, 55, president of the Santa Clara County Rose Society: “Back in the early days of the park, there used to be a lot of interest in the garden by the city and by the garden clubs. They had more time back then for things like gardening, and a real interest in beautifying San Jose. Things are different today. Most of the city council is more interested now in things like development. “Back in the ’80s and early ’90s, we could easily get 50 people out for a pruning. But we noticed a large drop-off in volunteers after the dot-com bust, when people started leaving the valley. You could see the change reflected in the condition of the garden. The city had to cut someplace, so they cut back on park crews. The garden was placed on probation in April 2005, but because of poor communication it wasn’t until this fall that supporters began their ride to the rescue. This past September, 150 volunteers responded to the call from Beverly Rose Hopper, who helped organize Friends of the San Jose Rose Garden, the adoptive guardians of the park. Through a private-public partnership with the city, Hopper hopes the Jan. 12 winter pruning will bring “a mass of volunteers to prune the whole garden, which will free up the city staff” to do battle with the weeds. 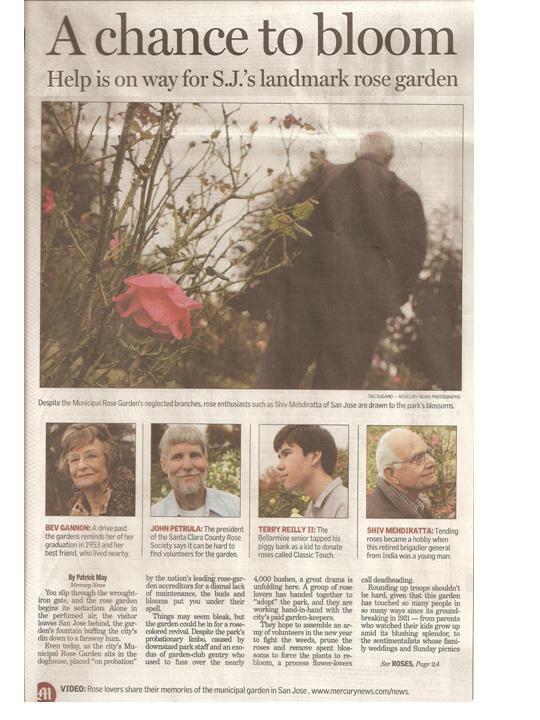 A decade ago, the city maintained a full-time staff of three at the rose garden. Now, that’s down by a third. Hopper says the dire condition of the garden already has touched a nerve in the community, reflected in this fall’s spirited pruning blitz. And many of those who answered the call, she says, are folks who have graduated or gotten married in the garden, a place that once and for all became a landmark in their lives. Terry Reilly II, senior at Bellarmine College Preparatory: “As a kid I remember going to the rose garden for pruning days. I was actually more experienced than some of the older folks, so I’d teach others how to deadhead roses. “When I was 6, they were having an issue with not enough funds to maintain the roses, and they were looking for people to donate rose beds. I remember going to my piggy bank, counting quarters to see if I had enough. I think my parents chipped in, but I paid my fair share, which was probably five bucks. As a soft wind slaps at the fountain’s spray, joggers encircle the rectangular park, passing pram-pushing nannies gossiping in lilting Spanish. Sunlight bathes the rosebushes, gilding every single flower. Those behind the garden’s adoption hope to build on that momentum next month, tapping into the love that roses seem to leave in their tracks wherever they may bloom. Shiv Mehdiratta, 79, retired brigadier general from India, San Jose resident since 2000: “I’m quite keen on roses. I grew them on my farm in India, close to Delhi. But my son and daughter moved here, so there was no one to take care of the orchard, so I sold it. And I miss it. “My daughter bought a house in 2003 and said, ‘Dad, how about putting in roses.’ I thought the best way to learn more about them was to join the rose society, and in 2003 I won the Best Novice Award. Then this year, I won for the best Fully Opened Rose. It was called Marilyn Monroe, a very pretty beige. “He’s 84 now and we’re still friends. When I go back to India, we have drinks. Anyway, that’s how I was bitten by roses. “And it all comes back to me in San Jose, when I walk into that rose garden.